​"Acknowledging Reciprocity: The Interrelations of Teacher Support, Grades, and Student Motivation Over Time"
Teacher support and grades are known to be related to student motivation and achievement-related behavior. However, not enough is known about how these contextual classroom factors and student motivation interact over time. Using data from 1986 students and their teachers from the longitudinal MSALT study, the current study investigates the longitudinal reciprocal interrelations of teacher support and grades with student motivation (success expectancies and subjective task value) and effort across two school years. Two-level cross-lagged analyses showed differential patterns of reciprocal relations between student motivation and effort and teacher support and grades. Findings suggest that student motivation and effort should not only be considered as important outcomes, but also as important antecedents to better understand classroom and teaching processes. "Argumentation and Explanation when Participating in After School Citizen Science Program"
The purpose of this video ethnographic case study will be to describe the interaction between students and how they interact and engage in authentic scientific practices in an after school citizenship science project. Preliminary findings show that students throughout the entire course of the program participated in some form of an authentic scientific practice such as gathering and analyzing data and samples. Peers notice students who position themselves outside of authentic scientific practices and make it known. The instructional aid’s engagement in authentic scientific practices positions the students as incorrect or wrong. Findings from this study highlight the importance participating in scientific practices mediates becoming part of a scientific community of practice with its own purpose, discourse, and methods. ​​"Assessing and Predicting Student Treatment Compliance in a Utility-Value Intervention Study"
The study of treatment fidelity including students’ compliance with the intervention material is essential to make valid claims about the effectiveness of motivational interventions. The current study assessed students’ treatment compliance in two classroom-based motivational interventions (writing a text or commenting on quotations about the personal utility of mathematics) through coding students’ essays. First, the degree to which students complied with the instructions, measured through three fidelity indicators (positive argumentation, personal connections, and innovative argumentation) was described. The fidelity criteria were then combined into a single compliance index. Students’ conscientiousness and motivational predispositions predicted treatment compliance positively for both interventions, but students’ cognitive ability and gender played a role only for the intervention based on free text writing. ​"Beyond Tracking and Detracking: The Dimensions of Organizational Differentiation in Schools"
We use administrative data from four large public school districts to articulate several dimensions of school-level academic tracking systems, investigate the school-level factors associated with these dimensions of tracking, and assess the consequences of school tracking systems and students' subsequent achievement. In contrast to the national probability sample data widely used in the tracking literature, our data make it possible to capture school differentiation practices in detail. We measure the extent to which schools horizontally differentiate curricula in middle school math and English, as well as the degree of selectivity, inclusiveness, scope, bias, and mobility among school tracks in these two crucial academic areas. We then examine the link between dimensions of organizational differentiation and students’ subsequent academic outcomes. ​"Collaborative Writing Patterns in a Cloud-Based Environment"
​​"Critical Colleagueship Among Secondary Science Teachers in a Video Club"
This study explores science teachers' critical colleagueship in the context of a semester-long video club. Participants engaged in the collaborative examination of artifacts of teaching to develop a more student-centered professional vision of teaching. Participants demonstrated attention to student thinking about disciplinary core ideas to problematize teaching and learning in science throughout the semester-long PD. Participants also utilized a mixture of evidence from artifacts in combination with professional anecdotes to make sense of the student reasoning in the artifacts. Participants built on each other’s ideas as well as challenged each other’s interpretations of student thinking as well as conceptions of core disciplinary ideas. The design features of the PD series and their possible influence on the group’s participation are discussed. ​​"Differential Vocabulary Growth Trajectories Among Adolescent Language-Minority Students: A Two-Year Longitudinal Study"
We investigated general and academic vocabulary growth trajectories of adolescent language minority students across two years. Our sample included 3,653 sixth- to eighth-grade students from an urban school district in California. Our language minority students included initially fluent English proficient (IFEP), redesignated fluent English proficient (RFEP), and limited English proficient (LEP) students. On both vocabulary measures, IFEPs slightly outperformed English-only (EO) students on average, and EO students scored higher than RFEPs and LEPs at baseline. There were differences in the general and academic vocabulary growth trajectories of students by language status. The findings of this study underscore that there indeed are differences within adolescent language minority students and suggest that educators need to take them into consideration in their instruction. ​"Does It Matter to Have an Adjunct Instructor in the Developmental Education Course? Evidence From a Community College System"
Our Study examined the impact of having adjunct instructors in developmental education, in both concurrent and subsequent course performance. Using unique longitudinal student-unit record data from a large community college system in one state, this paper extends the current literature on teacher effectiveness by examining the impacts of taking one’s developmental English and developmental math course with an adjunct instructor on the student’s current course, as well as on their enrollment and performance in the English and math gatekeeper courses. We used course fixed effects and instrumental variables to solve the potential student self-selection among course sections. This study provides key information to college administrators and policy makers about the characteristics and impacts of adjuncts in developmental education. ​"Effects of an Early Mathematics Intervention on Stable and Time-Varying Components of Mathematics Achievement"
The current study tested whether long-run treatment impact fadeout from a preschool mathematics intervention could be explained by a latent factor model that parsed the variation in long-run mathematics achievement measures into stable and time-varying components. Well-controlled correlational studies show a strong relation between children’s early mathematics skills and their later achievement (e.g. Duncan et al., 2007). Such correlational findings imply that if interventions can boost early mathematics achievement, the effects of such efforts may last many years. Unfortunately, recent evidence suggests that this may not be the case, as the treatment impacts of a successful preschool mathematics curriculum faded substantially in the years following the end of treatment (Clements et al., 2013). The current study hypothesized that such fadeout patterns could arise because the treatment affected time-varying aspects of mathematics achievement, but failed to affect factors related to mathematics achievement that were stable over time. We relied on data from the TRIAD evaluation study (Clements et al., 2013), which evaluated the scale-up of the Building Blocks (BB) preschool curriculum. The study randomly assigned schools to one of two conditions: BB preschool curriculum or control (business as usual). Student-level mathematics achievement was assessed at the beginning (pre-treatment) and end (post-treatment) of preschool, and follow-up assessments were collected in kindergarten, first, and fourth grade. We modeled the measures of long-run mathematics achievement from preschool through fourth grade as a state-trait model (see Bailey et al., 2014), in which we regressed a latent trait on the four post-treatment and follow-up measures of achievement. The trait loadings for this latent factor represented trait effects, or the amount of variance in the four measures that was stable over time. Within the model, we also regressed each measure of mathematics achievement on the previous measure; we refer to the resulting paths as “state effects” (amount of variation in achievement explained by changes in the previous measure). We then tested the effect of the treatment on both state and trait mathematics achievement. We found that the latent trait factor explained much more variation in mathematics achievement than the state effects, as trait loadings ranged from .76 to .94, whereas state effects ranged from .04 to .25. Further, we found that the treatment had no detectable effect on trait mathematics, but had a large impact on state mathematics (β= .53, p < .001), indicating that the treatment effects probably faded due to a failure to impact the stable characteristics that influence mathematics achievement over time. When we tested our model in both the treatment and control groups separately, we observed larger state effects for students in the treatment group. This indicates that more transfer of knowledge occurred in the treatment group, but these differences were only present in the two earliest follow-up measures. Our results suggest that a one-time intervention is probably not sufficient to affect mathematics achievement in the long-run, as such efforts are unlikely to affect the underlying factors that strongly influence achievement patterns over time. ​"Evaluating the Effectiveness of Inquiry-Based Science Instruction for English Language Learners: A Meta-Analysis"
Despite being one of the fastest growing segments of the student population, ELLs have yet to meet the same academic success as their English proficient peers, especially in science. In an effort to support the unique pedagogical needs of this group, educators have been urged to adopt inquiry-based approaches to science education. Although inquiry has been found to improve ELLs’ understanding of science, the magnitude of these effects and whether or not inquiry instruction provides comparable benefits to ELLs relative to their non-ELL counterparts, remain unexplored in the literature. In order to shed light upon this question, the current study conducted a meta-analysis and quantitatively evaluated the effect of inquiry-based instruction on science achievement for elementary grade ELL students. ​"Executive Functioning Deficits Increase Kindergarten Children's Risk for Reading and Mathematics Difficulties in First Grade"
Whether executive functioning deficits result in children experiencing learning difficulties is presently unclear. Yet preliminary evidence of this causal relation has many implications for early intervention design and delivery. We used a multi-year panel design, multiple independent and dependent measures, and extensive statistical control for potential confounds including autoregressive prior histories of both reading and mathematics difficulties to establish whether and to what extent executive functioning deficits uniquely predicted children’s risk for either type of learning difficulties. Results indicated that kindergarten children with working memory and, separately, cognitive flexibility deficits were at increased risk of experiencing learning difficulties in reading and mathematics by the end of first grade. The risks associated with working memory deficits were particularly strong. The for-profit college sector is arguably the most controversial and least understood sector of higher education. The last decade has ushered in a wealth of public concern and scrutiny as to whether for-profit colleges are providing a sufficient return on investment to students. There is much less empirical research on student experiences at for-profit institutions to better inform conceptual and practical understanding of this sector. Using ethnographic data from one mid-sized for-profit college, the author spent seven months exploring the learning environment. The findings illuminate four themes: 1) student desire for institutional transparency; 2) perception of high quality in-person instruction; 3) varied experiences based on student schedule and learning needs; and 4) role of age in shaping peer interactions. ​​"A Focus on Learning in the Field: Connecting Coursework and Field Experience Through Teacher Educator Collaboration"
This research investigates a collaboratively constructed observation tool as it is implemented by teacher educators into their direct work with pre-service teachers in the classroom. Constructed by the group with the explicit intention of connecting university coursework with field experience, research examines adaptations made by practitioners during feedback conferences with pre-service teachers and considers shifts in conceptions of their roles as teacher educators. Findings suggest an expanded role for classroom mentor teachers in teacher preparation, as mentor teachers are able to highlight key learning opportunities to pre-service teachers as they emerge in practice. In addition, findings point to the potential for school-university collaborations to improve coordination and coherence between coursework and fieldwork settings. ​​"Formative Assessment and Noticing: Toward a Synthesized Framework for Attending and Responding During Instruction"
In recent decades, two lines of scholarship have emerged that explicate the ways in which teachers attend to student thinking in the course of instruction. In mathematics education, researchers focus on noticing, or the process by which teachers see and make sense of particular events during classroom instruction. In science education, there is a focus on formative assessment, or the process by which teachers elicit and respond to student thinking on-the-fly. We propose a synthesized framework consisting of eliciting student ideas, attending to particular ideas, interpreting those ideas, deciding how to respond, and providing feedback. We analyze whole-class discussions to illustrate the utility of this synthesized framework, and connect our findings to core teaching practices for preservice and inservice teachers. ​​"Fostering Students' Value Beliefs for Mathematics With a Relevance Intervention in the Classroom"
Students’ interests for various subjects tend to decline across secondary school (e.g., Frenzel, Goetz, Pekrun, & Watt, 2010). Aiming to find ways to buffer this decline, researchers have developed targeted interventions based on expectancy-value theory (Eccles et al., 1983). Expectancy-value-theory differentiates between four types of reasons for students to engage in a specific task: intrinsic value, attainment value, utility value, and (low) cost. Focusing on the value component most malleable through external interventions, interventions try to increase the perceived utility value of the learning material (for an overview, see Harackiewicz, Tibbetts, Canning, & Hyde, 2014). However, through stimulating relevance, these interventions ultimately aim at developing students’ interest and promoting their engagement (cf., Hidi & Renninger, 2006). Relevance interventions can, therefore, yield insight into processes of interest development that are triggered through enhanced value. The aims of our current research are two-fold. First, we tested whether students’ value beliefs can be promoted through relevance interventions in the classroom. To answer this question, we compared two relevance interventions and examined effects of these interventions on all four value components. Second, we investigated whether these relevance interventions actually fostered interest development. To this end, we examined students’ situational interest regarding homework during the period after the intervention. Eighty-two ninth grade mathematics classes in Germany (N=1916 students) were randomly assigned to one of two intervention conditions or a waiting control condition. The intervention consisted of a 90 minute session on the relevance of mathematics for students’ future lives. In the quotations condition, students were asked to evaluate interview quotations on the relevance of mathematics. In the text condition, students were asked to write an essay about the relevance of mathematics to their lives. Using a 37-item scale tapping all four value components, students’ value beliefs for mathematics were assessed before and both six weeks and five months after the intervention. Additionally, students filled out a homework diary for four weeks after the intervention. Herein, students reported on their homework experience with respect to triggered and maintained situational interest. Students in both intervention conditions reported significantly higher utility value at the posttest as well as at the follow-up in comparison to students in the control condition. Additionally, students in the quotations condition also reported higher attainment value at both time points and higher intrinsic value at the follow-up. With respect to students’ situational interest regarding their homework in the four weeks after the intervention, students in the text condition reported a higher level of triggered situational interest, whereas students in the quotations condition reported a higher level of maintained situational interest. Our findings show that relatively short interventions in the classroom can be successful in promoting students’ value beliefs until five months after the intervention. The differentiation between multiple value aspects in expectancy-value theory is helpful in developing and evaluating interventions. Examining students’ interest development can shed further light on the mechanisms underlying intervention effects. Further analyses will examine how students’ value beliefs reported before and after the intervention are related to situational interest. ​"Has Kindergarten Become Too Academic? Instruction and Children's Development in the First Year of School"
How does time on academics in kindergarten relate to children’s academic and behavioral development? Do effects vary by type of academic content (e.g., basic or advanced) or by how it is taught (e.g., teacher-directed versus play-based)? Has the increased focus on academics in kindergarten over the past two decades resulted in changes in children’s learning and behaviors in kindergarten? We leverage the National Center for Educational Statistics two Early Childhood Longitudinal Studies (ECLS) of kindergarten; the Kindergarten Classes of 1998-99 (ECLS-K) and 2010-11 (ECLS-K:2011). Both are nationally representative, longitudinal samples of children who were in kindergarten in 1998-99 and 2010-11, respectively and include direct assessments of students’ academic achievement at fall and spring of kindergarten as well as teacher assessments of children’s social skills and behavior. In addition, teachers completed surveys and answered detailed questions about time spent on academics, the reading and math content they covered, and their instructional approach. We model the association between teacher-reported time use and children’s academic and behavioral outcomes in kindergarten. Our key explanatory variables are measures of classroom academic focus (e.g., time on reading and math, pedagogy measures of basic or advanced content, and teacher-directed or child-centered instruction). Our outcome variables are academic assessment scores and teacher-reported behavioral ratings measured in the spring of kindergarten. We control for the same measures assessed in the fall, such that our models capture cross-kindergarten growth and change, as well as an extensive array of child, family, teacher, and school characteristics. OLS regression results indicate, as would be expected, that overall time on academic content is positively associated with student learning gains. Further, students whose teachers report spending substantially less time on academic content have significantly smaller achievement gains. Interestingly, preliminary results also indicate that students in these classrooms – where less time is spent on academics – also experience reductions in internalizing and externalizing behavioral problems. Results from this study will inform the debate around kindergarten. Preliminary results suggest that kindergarten classrooms with a heavy academic focus may have positive effects on student achievement but negative effects on students’ behavioral outcomes. Implications for policy and practice will be discussed. ​​"Improving in Executive Function and Visuomotor Integration Predicts Kindergarten Achievement: Evidence From Two U.S. States"
This study examined whether children who improved in two cognitive skills, executive function (EF) and visuo-motor integration, learned more over the kindergarten year in mathematics and reading. In a single analysis (N=520), we combined similar data gathered with children from Oregon and South Carolina. Before and after kindergarten, children were assessed using the Head-Toes-Knees-Shoulders (HTKS) executive function (EF) task, the Beery-Buktenica Visuo-motor Integration (VMI) design copying subtest, and Woodcock-Johnson III Applied Problems and Letter-Word Identification. Hierarchical linear models found that, controlling for demographics and prior achievement, improvement in both EF and visuo-motor integration were each associated with improvement in mathematics and reading. Implications for early elementary teaching of the traditional achievement areas, i.e., through supporting foundational cognitive skills, are discussed. ​"Inside the Black Box of Self-Affirmation: Explaining the Effects on Achievement"
Despite numerous findings demonstrating that self-affirmation writing exercises improve academic outcomes for stereotyped groups, the mechanisms underlying the effects remain unclear. In this paper, we use data from a district-wide scale-up of a self-affirmation intervention to explore these mechanisms. We examine 1) how what students write about in self-affirmation exercises mediates the treatment effects, and 2) the extent to which these initial treatment effects on academics and behavior mediate long-term academic improvements. Our results show that complying with exercise instructions by engaging in perspective broadening writing is essential for the effectiveness of the exercises, and is associated with initial academic and behavioral improvements that explain the majority of the long-term academic treatment effects. ​"Is Delayed School Entry Harmful for Children With Disabilities? Evidence From North Carolina"
In recent years, increasing numbers of parents have been choosing to delay their child’s entry into kindergarten, commonly referred to as “redshirting”. In addition, several states have increased their age cutoffs for kindergarten entry, requiring that children be at least five years old at the start of kindergarten. This trend has been influenced by both evidence suggesting positive effects of entering school at an older age, and marked increases in educational accountability. However results of research on the effects of age at school entry are equivocal, including evidence that delaying entry to school may be detrimental for children, especially for at-risk populations. Indeed, there exists a strong empirical basis for early educational interventions for impoverished children and children with special needs (Yoshikawa et al., 2013). We use recent (2006-2014) statewide micro-level census data from North Carolina, including student’s exact birthdates and information from kindergarten through 3rd grade to examine differences in the incidence and type of disability designations amongst children who enter kindergarten on time and those who are redshirted, and test for differences in student achievement on reading and mathematics exams at the end of 3rd grade by disability designation. North Carolina public schools use ten specific disability designations: Autism Spectrum disorders, Deaf-Blind, Deaf & Hard of Hearing, Emotional, Intellectual, Significant Cognitive, Specific Learning, Speech-Language Impairments, Traumatic Brain Injury, and Visual Impairments. We also estimate selection models to test whether parents’ decisions to delay their child’s entry into kindergarten are associated with the type or severity of children’s later designated disability. We include student, classroom, and school-level covariates, along with district-level fixed effects to account for differences in disability testing policies. Preliminary results indicate that redshirted students were overwhelmingly more likely to be designated by their school as having a disability - up to 2.8 times the risk of being designated as disabled. Furthermore, students who were both redshirted and disabled were associated with significantly lower math and reading achievement (0.2 SD) at the end of 3rd grade compared with disabled children who entered kindergarten on time. Our study has several important policy implications. First, this study will provide information on whether test score outcomes for disabled redshirted students vary substantially across categories of disability. If certain disability categories are more negatively related to third grade outcomes, these findings could facilitate targeted dissemination of the negative effects of redshirting and the importance of on-time school enrollment for children within the categories of disability associated with diminished outcomes. Finally, this can help to inform state-level implementation of IDEA services. Preliminary results indicate that children with disabilities are better off starting elementary school as soon as they are eligible rather than spending an additional year “redshirted”, thereby delaying kindergarten entry. Results also highlight the role of public schools in delivering services to children with disabilities. ​"Kindergarten Components of Executive Functions and First-Grade Achievement: A National Study"
This study replicates and extends past research on the relationship between school-entry readiness skills and achievement using nationally representative data from the ECLS-K 1998-1999 and 2010-2011. This study replicates with new data that early academic skills and approaches to learning behaviors are predictive of first grade reading and math outcomes. New evidence is provided that in addition to these skills, components of executive functions are also predictive of outcomes. In the absence of controls for children’s approaches to learning behaviors, executive functions contributed significantly to predicting later reading and math outcomes. One factor conceptualized as executive functions indicated that these skills are substantial developmental predictors of later achievement, although associations are still less than those found for school-entry achievement skills. ​"A Meta-Analysis of One-to-One Computing and Academic Achievements"
​"Noncognitive Skills as Mediator of Relations Between Middle Childhood Organized Activities and Later Academic Performance"
Organized activities are associated positively with academic functioning, with gender sometimes moderating these effects. However, the mechanisms of these relations are unclear. Using data from NICHD Study of Early Child Care and Youth Development, we test the hypothesis that organized activities are supportive contexts for the development of noncognitive skills and that these skills, in turn, support positive academic functioning. Structural equation model results indicate that middle childhood organized activities positively predict end of high school grades, and that this relation is partially mediated by noncognitive skills at Grade 9 in girls. Future out-of-school research should consider the development of noncognitive skills as a mechanism explaining academic outcomes, while simultaneously examining the moderating role of gender. ​"Not Writing" Writing: Learning Identity Stances in Networked Fandoms"
This paper uses discourse analytic techniques to inquire into the stances toward learning taken by young people and parents in two distinct informal learning environments: an online platform to share creative writing and a Lego-sponsored exhibit at a Children’s Museum. Combining ethnographic observations and in-depth interviews, this inquiry explores how participants understood learning and schooling and how they positioned their identity vis-à-vis learning and schooling. The two learning contexts profiled here vary in terms of structural features, learner populations, and involvement of digital publics. The first studied context is a mobile creative writing app called Wattpad, especially popular with adolescent girls. The second is a museum exhibit sponsored by the Lego Corporation aimed at educating elementary school-aged children on building mechanics. Because the contexts of study are distinct, they afford a fruitful comparison of the environments and the identity stances made available in those environments. Interviews with 12 youth participants in each context, their parents, and a multimodal examination of their “works” (creative writing pieces and construction sets, respectively) form the backbone of this analysis of learning identity formation. Thematic and axial coding techniques (Saldaña, 2009) are enrolled to compare the two learning environments and the affordances and constraints they entail for identity building. Designed environments -- whether physical or digital -- invoke sensibilities, scripts, and social actions, but humans acting within them do the important interpretive work of figuring out the context, what actions belong within it, and, identity “stances” (Gee, 2005). Drawing from critical literacy studies (Luke & Carrington, 2002), I consider how learning environments structure learning stances, dispositions, and positions. Laying out different perspectives on identity as an analytic lens in education research, Gee (2001) posits a tension between the institutional identity perspective and the affinity identity perspective. Institutional identities are imparted onto people by institutions (e.g., school) while affinity identities map onto identity stances based on shared interests (Gee, 2005). This contrast is explored in how and when participants narrate their interest driven activity as helpful for education, schooling, learning, or development. Processes of identification are interrogated within the contours of the particular learning context and the social location of each participant. For instance, some creative writers were able to map their practices onto those of schooling while others call it “not writing” writing distinguishing from school. In parallel, some parents of Lego fans translated play into developmental benefits, drawing on discourses borrowed from pop psychology while others located these practices outside of learning and development. Preliminary analyses show that notions of class and scripts of status mediated the intersection of affinity and institutional discourses. Broadly, this study considers the way that youth negotiate narratives of identity not of their own making and the way that youth construct their own narratives of the self within power-laden overlapping networks of adult and peer group relations. Understanding how young people and their parents see themselves as “learners” and how such identities are afforded in digitally-mediated spaces has the potential to contribute to the conversation around learning across contexts. ​"Preservice Teachers' Mathematics Teaching Competence: Comparing Performance on Multiple Measures"
This study examines the relationship between pre-service teachers’ performance on a teaching performance assessment for licensure in elementary mathematics and two measures of knowledge that, in studies of practicing teachers, were found to predict effective mathematics teaching. A sample of 91 pre-service teachers completed the Performance Assessment for California Teachers (PACT), the Mathematics Knowledge for Teaching (MKT) survey, and the Classroom Video Analysis (CVA) Instrument. Correlation analyses found overall weak associations between measures for the whole group, but differences emerged for groups of high- and low-performing pre-service teachers. In addition to suggesting areas for future research, the findings raise questions about assessing pre-service teachers’ readiness to teach mathematics and the use of a single measure to make licensing decisions. ​"Professional Development Informing Practice and Practice Informing Professional Development: An Iterative Improvement Approach"
Inquiry science instruction is especially challenging in elementary grades where teachers are constrained by crowded curricula and time. Professional development (PD) may provide an opportunity to support elementary teacher development of inquiry science instruction. The study examines the inquiry practice of two teachers who participated in an inquiry science PD and the relationship between their enactment of inquiry and PD experience. Classroom observations, teacher interviews and surveys, lesson plans, teacher presentations, and videos from the PD were analyzed. Teachers’ inquiry enactment assessed through discourse analysis revealed teacher controlled discourse, low level questioning, and limited discussion. Analysis of the PD revealed limited teacher opportunities to experience inquiry, and a disconnect between lesson content and inquiry practice. Implications for PD are discussed. ​"Racial Achievement Gap in Early Science Achievement"
Previous research has recognized the importance of racial disparities in reading and math achievement while little is known about early science. This paper utilizes the ECLSK: 2011 to provide an up-to-date examination of racial achievement gaps in science during the first two years of school. Large gaps were found among Black, Hispanic and Asian students relative to whites. Family characteristics and school quality can explain some, but not all, of the racial science gap. From kindergarten to the 1st grade, Hispanic-White gap and Asian-White gap in science have decreased, but the black-white science gap does not change much. ​"Reappraising Adversity Improves Students' Academic Achievement, Behavior, and Well-Being"
Most people experience occasional threats to their sense of social belonging. This study examined how an intervention designed to help students to reappraise academic and social concerns might alleviate the negative effects of the transition from elementary to middle school on students’ grades, behavior, and well-being. Social belonging is defined as a sense of having positive relationships with others (Walton and Cohen, 2011) and is theorized to be an essential human need (Baumeister & Leary, 1995). When students transition from school to school, they may experience a perceived threat to their sense of fitting in, called belonging uncertainty (Walton & Cohen, 2007). In this psychological state, students associate ambiguous or negative cues in their environments (e.g., getting one bad grade, having an argument with a friend) with the idea that they do not belong, and often attribute the cause of this non-belonging to internal and permanent characteristics instead of changeable conditions (Sekaquaptewa, 2011; Murphy et al., 2007). This attribution error cultivates a negative feedback loop; as students vigilantly assess all available information in order to figure out if they are capable of making it academically and socially in their new environment, negative or ambiguous information confirms their interpretation that they do not belong academically and socially, which leads to diminished academic motivation and effort (Thoman et al., 2013). Social belonging interventions can mitigate such attribution errors by normalizing the fears of failure about academic achievement (Walton & Cohen, 2007). This intervention alters students’ mindsets by helping them to reappraise academic and social adversity. The intervention (a) provides reassurance that difficulties occur for everyone, and not just particular students or groups, and (b) suggests that the situation will naturally resolve with time. This normalization process can change how students interpret stress (i.e., from unchangeable to changeable) in school during difficult transitions. During the 2013-14 school year, all sixth-graders in a racial diverse school district were involved in a randomized controlled trial to assess the effectiveness of a social belonging intervention (see Table 1 for experimental balance). Study outcomes of interest included students’ sixth-grade GPA, failing grades, behavioral referrals, absences, and four measures of student academic well-being, including school trust, social belonging, evaluation anxiety, and identification with school, which were measured pre- and post-intervention. Controlling for pre-treatment performance and several demographic factors (e.g., free/reduced lunch status), we found significant intent-to-treat effects for all outcomes in the expected directions. While students entering middle school are at an increased risk of belonging uncertainty, and typically experience a downward trajectory in academics and well-being, the results of this study show that a social belonging intervention can substantially mitigate this phenomenon and improve students’ academic outcomes. The practical implications of such an intervention are far-reaching. In addition to immediate academic, behavioral, and social and psychological improvements, reaching students at such a critical juncture has the potential to prepare students for longer-term success, including preparation for college and the workforce. ​"Reducing Achievement Gaps in Academic Writing for Latinos and English Learners in Grades 7–12"
This study reports findings from a randomized controlled trial of a professional development program that takes a cognitive strategies approach to teaching text-based analytical writing to students, specifically Latinos and mainstreamed English Learners (ELs). 95 teachers in 16 secondary schools were stratified by school and grade and then randomly assigned to the treatment or control group. Treatment teachers participated in 46 hours of training to help students write analytical essays. Difference-in-differences and regression analyses revealed significant effects on student writing outcomes in both years of the intervention (Year 1 d=0.48 and Year 2 d=0.60). Additionally, treatment students had higher pass rates than control students on the California High School Exit Exam in both years. ​"Repeated Evidence of Minority Underrepresentation in Special Education"
We summarize findings from five recent studies examining minority disproportionate representation. We situate these five studies within conflicting theoretical and empirical work regarding whether minority children are disproportionately over- or under-represented in special education. We briefly summarize this conflicting work, provide both methodological and substantive limitations that may account for these conflicting findings, and report on mechanisms (e.g., school-level economic and racial composition) that may explain disparities in disability identification and treatment. We overview multivariate analyses of two nationally representative and longitudinal datasets maintained by the U.S. Department of Education. We report results using a range of analytical methods, including multilevel logistic regression modeling and event history modeling, as well as estimates for special education placement generally and across specific disability conditions. These analyses were designed to account for an unusually extensive set of potential confounding factors (e.g., individual-level academic achievement, family economic resources, school-level racial composition) when estimating minority children’s likelihood of being identified as disabled and so placed into special education, thereby allowing for contrasts with “otherwise similar” white, English-speaking children. Our results repeatedly indicate that minority children are less likely than otherwise similar white, English-speaking children to be identified as disabled and so receive special education services for which they may be legally entitled. The magnitude of these disparities can be quite large (e.g., a 60% difference in the estimated odds ratios). We find that under-identification is evident both prior to and following school entry, in separate analyses of the two datasets, and both for special education generally as well as across a range of specific disability conditions. This includes under-identification for both intellectual disabilities and emotional disturbances, the two conditions which minority children are often reported to be over-identified for. For example, we find that black children are 57% (covariate-adjusted odds ratio = .43) and 64% (covariate adjusted odds ratio = .36) less likely to be identified as having intellectual disabilities and emotional disturbances, respectively, than otherwise similar white children. We provide empirical evidence indicating that attending racially segregated schools may be a mechanism that helps explain minority children’s under-representation. Results from the five studies help address substantial ambiguity for researchers, practitioners, and policymakers as to whether minority children are over- or under-represented in special education. Our work addresses previously identified substantive and methodological limitations in the existing work (e.g., National Research Council, 2002). These results also have far-reaching implications. For example, our results suggest that current federal legislation and policy, which is largely directed towards reducing minority over-representation, may be inadvertently exacerbating racial/ethnic disparities in disability identification and treatment. ​"The Roles of Transfer and Forgetting in the Persistence and Fadeout of Early Childhood Mathematics Interventions"
The fact that mathematics achievement gaps develop prior to school entry suggests the need to develop effective early childhood mathematics interventions. While effective interventions have generated immediate positive effects on mathematics achievement, many of these effects dissipate, or fade out, over time while only few persist. This study extends early math intervention research by focusing on how children’s cognitive processes mediate the effects of Building Blocks – an established pre-K mathematics curriculum intervention that utilizes manipulatives and computer objects to mathematize everyday life. This investigation helps in better understanding how students remember and forget math skills over time, ultimately informing educators interested in prolonging early math intervention effects to help create longer-lasting interventions that will better benefit disadvantaged students in the future. Using the TRIAD evaluation dataset and logistic regression analysis, this study estimates the mediating effect of cognitive processes, particularly forgetting and learning transfer, on the fadeout and persistence of Building Blocks. This study also investigates the effect of having a sustaining environment mitigate forgetting and promote learning transfer. Control and treatment group differences in forgetting account for about 15% of the fadeout of the intervention effects, and this difference was reduced by one-third with a sustained environment. Control and treatment group differences in learning difficult questions in later grades account for about 51% of the persistence of the intervention effects, although this only accounted for 20% of the initial effect. Since the ratio of transfer to original learning gain is very small, this suggests that the key to creating persistent math intervention impacts may rely more on mitigating forgetting through creating sustaining environments for students after the intervention. ​"Schools, Maintained Inequalities, and Algebra for All"
​"Science Achievement Gaps Begin Very Early, Persist, and Are Largely Explained by Modifiable Factors"
We examined the age of onset, over-time dynamics, and mechanisms possibly underlying the science achievement gaps commonly experienced by at-risk elementary and middle schoolchildren in the U.S. Analyses of a longitudinal sample of 7,757 children indicated large gaps in general knowledge already evident at kindergarten entry. Kindergarten general knowledge was the strongest predictor of first grade general knowledge, which in turn was the strongest predictor of science achievement from third to eighth grade. Large science achievement gaps were subsequently evident when science achievement measures first became available in third grade. These gaps persisted until at least the end of eighth grade. Most or all of the observed science achievement gaps were explained by the study’s many predictors. ​"Sustaining Teacher Change: Examining Factors That Influence the Longevity of Professional Development Outcomes"
This longitudinal study investigated the extent to which state-funded teacher professional development designed to improve K-2 science led to changes that persisted two and three years beyond the funding period. This study included 30 teachers, representing 14 schools and 13 districts. Data sources included a teacher survey, self-efficacy assessment, and interviews. Separate linear mixed effects ANCOVA models were fit to teacher ratings for all outcome measures. Results indicate instructional time in science and teachers’ use of inquiry-based and student-centered strategies remained stable after the program ended. In contrast, teachers’ perceptions of principal support for teaching science and their self-efficacy related to science instruction significantly decreased. The research identifies factors that influence long-term changes, leading to practical implications for follow-up support. ​"Tracking High School Students' Pathways to Male- and Female-Dominated STEM Careers"
STEM has recently become bifurcated into male and female dominated fields, making it crucial to no longer consider STEM as one uniform, male-dominated concept. This study uses the Education Longitudinal Study nationally representative dataset to examine students’ decisions to choose a STEM major, earn a STEM bachelor degree, and have a career particularly in male or female dominated STEM fields. Results show, most high school students expect to go into careers traditionally associated to their gender, which matters greatly for declaring a major, earning a degree, or having a career in male- or female-STEM. Self-efficacy, course completion and math achievement are less effective indicators. Educators should encourage students to pursue careers contrary to how the STEM field is gender stratified. ​​"Traditional Gender Role Beliefs Have Consequences: Long-Term Impacts on Educational and Occupational Choices"
Gender-role beliefs are key determinants of adolescents and adults’ occupational and educational aspirations and choices (Schoon & Parsons, 2002). These gender-role beliefs develop in response to important socialization experiences, such as parents’ gendered beliefs, actions and behaviors (Witt, 1997). The current study investigated how parents’ traditional gender-role beliefs and educational attainment are associated with adolescents’ gender-role beliefs and subsequent gendered aspirations, occupational and educational attainment. Using data from participants of the 30-year longitudinal MSALT study and their parents, multi-group path analyses showed differential associations of mothers and fathers’ traditional gender role beliefs with male and female adolescents’ gender role beliefs. These gender role beliefs, in turn, showed differential associations with occupational and educational attainment for females than males. ​"A Two-Year Campus-Wide Study of Student Response Systems in STEM Courses"
Student response systems (or clickers) can enhance classroom interaction and provide formative feedback for both students and instructors. The present population-based study involves two years of naturalistic observations of 133 undergraduate courses in biology, chemistry, mathematics, statistics, and physics, 39% of which employed clickers. Course observations were conducted to evaluate the frequency and type of clicker use during class. Results from year 1 indicate that clicker usage was positively associated with higher grades in the course as well as grades in the subsequent course. Clicker use was associated with slightly less likelihood of progressing to the next course. Preliminary year 2 results provide more detailed qualitative information on clicker usage. ​"Three Unique Approaches to Introductory Biology: A Comparison of the Attitudes and Academic Outcomes of Underrepresented Groups"
The present study observed 10 course sections of introductory biology (N = 3,706) taught with three distinct methods (flipped, blended, and traditional) in fall of 2014 and 2015. The flipped method of teaching was associated with a .13 standard deviation increase in course grade (p < 0.01) and the students were 20% more likely to take the next course in the sequence. Student interviews reveal compelling stories of underrepresented students pursuing majors in STEM (science, technology, engineering, and math). We present the experiences of first generation, ethnic minority, and transfer students in these settings to explain the positive student outcomes in the flipped format. ​"Understanding Latino Parents' Support of Their High School Students in Science: Insights From Mixed Methods"
High school is a pivotal point in the STEM pipeline in the United States (Maltese & Tai, 2011). Approximately, 45% of US 10th grade students interested in pursuing a STEM career lost that interest by the end of high school (Aschbacher et al., 2010). Females and Latinos are at a particularly high risk to leave STEM. According to the Eccles’ expectancy-value model, parental support bolsters adolescents’ science motivation and should lessen the risk for dropping out (Wigfield et al., 2015). But, much of the existing empirical work focuses on elementary school and non-Latino students (e.g., Simpkins et al., 2015). Moreover, questions concerning the direction of influence (e.g., are parents driving the processes or reacting to adolescents’ achievement) become central during this age period but have yet to be addressed. Therefore, the goal of this mixed-methods study was to examine the relations between Latino parents’ support and adolescents’ ability and motivational beliefs at 9th and 10th grade. Longitudinal data on 103 Latino parent- student dyads (see Table 1 for participant information) were collected in 9th and 10th grade (the 2012-2013 and 2013-2014 school years, respectively). Quantitative data were collected on parents’ science-specific support (reported by parents, 6-10 items, α =.75-.81), adolescents’ science ability (reported by teachers, 3 items, α =.96), and adolescents’ science ability self-concept and value (reported by adolescents, 12-15 items, α =.92-.95). Semi-structured qualitative interviews were conducted with adolescents and parents in 10th grade on a variety of topics including adolescents’ value of science, parents’ support of the adolescent in science, and who the adolescent goes to for science help. We characterized parents’ science support in terms of their overall support as well as three specific types of support: (a) coactivity, (b) school involvement, and (c) positivity. The quantitative results are similar across parents’ overall support and the three specific types of parents’ support, as well as within each wave and longitudinally. As shown in Figure 1, parents’ overall support was not related to adolescents’ science ability (or motivation), which contradicts previous work suggesting parents’ support is a positive predictor in a variety of domains (Simpkins et al., 2015; Wigfield et al., 2015). The six sections shown in Figure 1 are defined by the quantitative data and will determine our groups for the qualitative analysis. Comparisons across cases within each group and across groups will help explain cases that are unexpected based on theory. For example, it is possible that the adolescents in section 1 exemplify the natural developmental progression of increasing autonomy in areas in which adolescents are skilled. Alternatively, it is possible that parents in section 1 have little involvement do to cultural or socioeconomic barriers and that adolescents are succeeding due to other non-parental supports or individual assets. The qualitative findings will provide insight into the universality of the expectancy-value model and what other indicators need to be considered to understand the complex relations among Latino parents’ science support and adolescents’ ability and motivation. ​"Unpacking Reading Performances of Reclassified Fluent English Proficient Students"
We examined academic vocabulary, general vocabulary and reading comprehension growth trajectories of adolescent reclassified English proficient (RFEP) students using individual growth modeling analysis. Our sample included 1,226 sixth to eighth grade RFEP students from six schools in an urban school district in California. Students completed up to four waves of reading-related measures during two-year time period. Our findings indicate that 1) students’ scores on vocabulary and reading assessments were correlated with their years since redesignation and 2) students showed growth over time on all outcomes on average and the rate of growth did not differ by their years since redesignation. The results underscore the heterogeneity in reading-related outcomes within the RFEP student population. ​"Who Holds a Fixed Mind-Set and Whom Does It Harm in High School Mathematics?" Research on theories of intelligence has shown that students with growth mindsets tend to outperform those with fixed mindsets in mathematics. However, most research has not examined whether holding a particular mindset varies by subgroup, including gender, ethnicity, socioeconomic status, or achievement level, or whether holding fixed mindsets is particularly detrimental for any of these subgroups. Using a nationally representative dataset, we find that white students and students with higher socioeconomic statuses are more likely to view intelligence as a fixed trait than nonwhites and students from lower socioeconomic backgrounds. We also find that students with fixed mindsets and the lowest prior achievement scores experienced the greatest decrease in their 12th grade math achievement scores relative to the highest achievers. ​Invited Speaker Session: AERA 2017: You Only Have a Year to Get Your Next Proposal Ready! The 2017 annual meeting will be in San Antonio for the first time ever—very exciting! Everyone will want to attend and enjoy the South West, so competition for a space on the program will undoubtedly be steep. You can get a leg up on your proposal for 2017 by talking to the 2016 section chairs—they know what it takes to develop a great proposal and they are waiting to talk to you. In this session, 1) what makes a strong proposal; 2) choosing the right section for your submission; 3) common mistakes to avoid; 4) the review process including criteria and standards. You won’t want to miss it! ​The purpose of this session is to facilitate roundtable discussions with leading higher education scholars on the development of three documents that are important for new scholars: research agenda, job search documents, and grant proposals. These roundtable discussions have been purposefully planned in speaking to graduate student concerns at different stages in their academic/professional development. The session will be organized into three roundtables with 2-3 faculty facilitators for each. Recent research provides strong evidence that unequal educational outcomes between richer and poorer students are due in part to curricular inequalities occurring within schools and between schools. Accordingly, rather than ameliorating background inequalities, the U.S. educational system may be exacerbating them. This session premiers a new short video—an artifact of public scholarship that communicates these research findings. Scholars from multiple disciplinary perspectives (sociology, economics, political science, and educational theory) will discuss implications of this research. They also consider how public scholarship focused on schooling inequality; its relationship to larger social, political and economic inequalities; and the public’s understanding of what a commitment to equality requires can inform and be informed by insights from different intellectual perspectives. If we believe that Black lives matter; education research must engage the entire spectrum of factors that marginalize and limit Black students’ educational opportunities and outcomes. This interactive dialogue moderated by the Executive Director of the White House Initiative on Educational Excellence for African Americans, examines topics like the school to prison pipeline, post-traditional student experiences and nontraditional college pathways, Black student protest in the K-College Pipeline, and the educational opportunities Black students do and do not have. Accordingly, this session aims to change the narrative by focusing on the “unheard” and “overlooked” in the Black student research agenda, towards new scholarly and policy approaches for k-12 and higher education. Over past decades, we have seen an influx of state and educational policies being implemented to reduce educational gaps and promote access and success. Yet, it has been the case that many of these schooling policies have backfired. That is, policies that were explicitly intended to reduce educational gaps through changes in schooling structures and practices have indeed caused the reverse effect – a widening of the gaps that they had indeed set out to close. This session represents a unique opportunity to present a multifaceted, multidisciplinary examination of instances when educational policymaking and practice do not converge. This session takes a critical look at these policies, why they backfired, and what we can learn. This session brings together international longitudinal findings from Australia, the U.S. and Europe regarding the effects of student-perceived and actual parents’ beliefs and behaviours on adolescents’ and young adults’ motivation and choices in STEM disciplines. Based on the Eccles et al. expectancy-value theoretical framework, the quantitative and mixed-methods studies investigate the psychological processes through which parents’ beliefs and behaviours influence their children’s motivation, educational and occupational plans and decisions, also considering the role of gender and socio-cultural context. All four studies analyse longitudinal data. Two studies include multi-informant data, one study applies a mixed-methods design. Taken together, complementary studies provide developmental insights into students’ motivational processes and choice behaviours in STEM. Much of elementary school language arts teaching remains in a print world: paper-pencil, books, book reports, workbooks and book talk, not in a digital world: keyboards-screens. e-books, multimedia, apps and social media. How to innovate best practice in digital language arts curriculum and implement in real classrooms is a complex problem. Using an implementation research approach, symposium papers report small-scale studies on the transition from print-based to digital teaching on students’ online reading comprehension, teachers’ ed tech professional development, digital intervention program evaluation and district-level fiscal forecasting. Results describe the promise and pitfalls of tech in transforming to digital teaching while addressing the increasing demands for universal basic literacy, e-reading skills and high quality teaching. This symposium’s objective is to discuss how teacher educators leverage video-based pedagogies to support teacher learning related to pedagogical moves, the teacher’s role, and student contributions. Consistent with efforts to encourage teacher learners to attend and respond to student learning, each paper highlights how teacher learners’ sense-making about effective instruction changes over video analysis projects. Presenters explicate how teacher learners benefit from video analyses and discuss the opportunities and challenges in facilitating this work (van Es et al., 2014). Bringing together researchers who work with in-service and pre-service teacher learners across elementary science, elementary and secondary literacy, and secondary social studies sheds light on commonalities and discipline-unique aspects of facilitating video analysis to help teacher learners prioritize student thinking. Presentation Title: Person Characteristics and Participation in Out-of-School Contexts: Are Developmental Outcomes Driven by Selection Bias? Presentation Title: Math Growth Mindset in Adolescents: Is the Key to Success Effort or Talent? Presentation Title: Does the Expectancy-Value Model Hold for Latino Parents of High School Science Student? UCI School of Education National Ranking Advances to 25th in U.S.
UC Irvine's School of Education is continuing to receive national recognition for the quality and innovation of its programs and research. Since first ranked in 2007 at 88th among Graduate Schools of Education, the School has advanced each year, achieving this year's US News & World Report ranking of 25th. 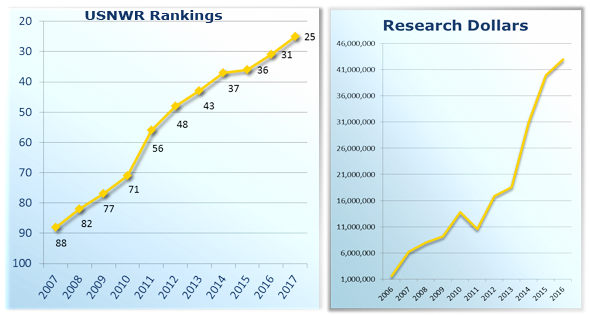 Paralleling the rise in national rankings is the School's growth in funded research, from $1.5 million in 2006 to $43 million today. Current research funding ranks UCI's School of Education in the top 1% nationally in grant funding per faculty. UCI's School of Education also ranks in the top 1% in the U.S. in articles published per faculty member and in citations per faculty member. Contributing to the School's growth in reputation since 2007 is the introduction of a series of innovative programs to train academics, researchers, and practitioners in addressing the pressing needs facing education. These include the 14-month Master of Arts in Teaching + Teacher Credential (MAT); the UCI CalTeach Science and Math initiative offering undergraduates a STEM degree + Teacher Credential, both in four years; the B.A. in Education Sciences, the first undergraduate program in the U.S. to address education as an academic discipline; the Certificate in Afterschool Education (CASE), designed to increase the quality of instruction and administration in afterschool programs; and the Afterschool Outcome Measures Online Toolbox, created to measure program quality and youth outcomes in afterschool and summer programs throughout the U.S.
UC Irvine's Ph.D. in Education continues to attract outstanding doctoral students drawn to the program's three specializations: Learning, Cognition, and Development; Educational Policy and Social Context; and Language, Literacy, and Technology. Graduates have been placed in tenure track and research positions throughout the world. ​UCI's School of Education will continue to promote and disseminate educational research and practice devoted to "Expanding Minds, Transforming Lives." "SoE Submission Selected for Class Gift from 2016 Graduates"
UCI seniors have a long tradition of giving back to UC Irvine through a senior class legacy project. UC Irvine landmarks such as the Student Center Bell Tower, the Peter the Anteater benches and statues found across campus, and class scholarships are the result of senior class spirit and financial support. Each year, all UC Irvine schools and departments are invited to submit proposals for that year’s project. The School of Education submission for the 2016 class project recommended purchasing telepresence robots for UCI students who encounter illness as a barrier to completing coursework. 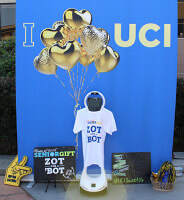 "The telepresence robots will allow UCI students to continue attending classes when symptoms or treatments for illnesses (e.g., cancer, heart disease, immunodeficiency, etc.) do not allow them to be present for classes and activities as needed. Students can control these robots from home to move around classrooms, listen and talk to professors and classmates, and even participate in extra-curricular activities and meetings." ​The School of Education’s winning entry is now the focus of a fundraising campaign that will last into the fall and will culminate in presentation of the “Class Gift” to the university. Olson, C.B., Scarcella, R., & Matuchniak, T. (February 2016). The write stuff. Educational Leadership, 73(5), 38-44. Summation: Three essential practices bolster English language learners' writing skills. Create a culturally relevant writing community. The statistic is alarming. A mere one percent of 12th grade English language learners (ELLs) scored proficient or above in writing on the most recent administration of the National Assessment of Educational Progress in 2011 (National Center for Education Statistics, 2012). It's no wonder. The language demands associated with writing and the many constraints adolescent ELLs must juggle are formidable. These students face not only cognitive, communicative, and contextual challenges common to all writers, but also linguistic, cultural, and affective constraints unique to language learners. In the current era of the Common Core State Standards for English Language Arts (CCSS-ELA), students are expected to master high-level literacy skills, including reading closely to make logical inferences and writing to support claims using valid reasoning and appropriate evidence (National Governors Association Center for Best Practices & Council of Chief State School Officers, 2010). Placing such a premium on the ability to interpret texts and to write extensively about those texts using academic discourse sets a high bar for all students, and especially for ELLs. What does it take to help ELLs undertake such challenging writing tasks? To answer this question, we offer three research-based instructional practices that promote ELLs' development of academic literacy, as well as two activities to support each practice. First and more important, we consider culturally responsive curriculum and the significance of motivation. Second, we look at teaching students strategies, one of the most effective practices for literacy development for all students, including ELLs. And finally, because researchers generally reject the notion that academic language spontaneously develops, we explore explicit instruction that models appropriate language use.